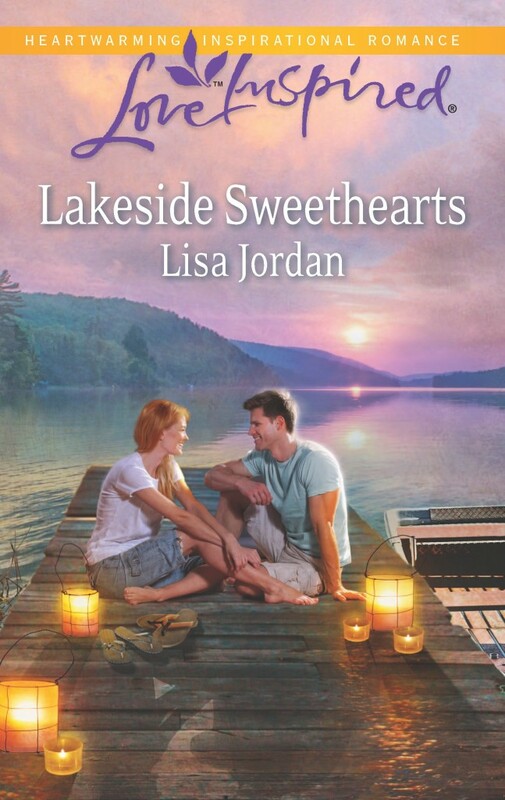 Last Wednesday I opened my computer after work and received a sweet surprise: the cover for my third Love Inspired book that releases in June–Lakeside Sweethearts. 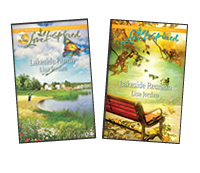 Copyright © 2013 by Harlequin Enterprises Limited Cover Art used by arrangement with Harlequin Enterprises Limited ® and ™are trademarks owned by Harlequin Enterprises Limited or its affiliated companies, used under license. 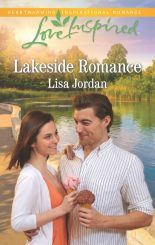 I’m so thrilled they chose a dock for the cover art because it’s where Agnes and Ian spend a lot of time building their relationship. Plus, the lanterns and sunset create a romantic atmosphere. I absolutely love this cover. I hope you do too…and Agnes & Ian’s story. Your Turn: What elements do you like to see on book covers? Last August our family experienced another change in our lives–our youngest went off to college, leaving Hubby and me with an empty nest. By day, our house is filled with noise and chaos because I own and operate a family childcare program. Once that last Little Darling leaves for the day, and dinner is over, I sit in my comfy chair in the living room to pick up where I left off with my current WIP (work-in-progress). With only Hubby and me at home, I’ve noticed something very annoying…the ticking clock hanging on the living room wall. Holy cats, that thing is loud! When our boys are home, and the Xbox is being played, then the ticking is drowned out by whatever gaming chatter. Then I realized something else…I missed having someone to care for. Hubby doesn’t count because he’s quite self-sufficient, and my Little Darlings don’t count because they leave before dinner. I needed someone or something to take care of, so I started talking to Hubby about a dog. We had a beautiful yellow Lab about 14 years ago named Samantha Jane. Due to our son’s allergies at the time, and Samantha’s size with my Little Darlings, she wasn’t the best fit for our family. She ended up moving to a farm to live with a couple who had another dog and wanted a playmate for her. Anyway, Hubby wasn’t too excited about the dog thing and suggested we wait until spring. 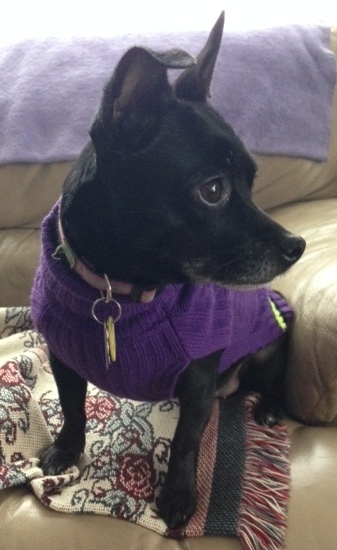 For her birthday, my mom adopted a sweet little chihuahua mix dog named Penelope, who may be older than the 3 years the shelter claimed. This little sweetheart burrowed herself into my heart, especially after I became Penny’s official dogsitter when my mom was hospitalized two different times for heart issues. I kept telling Mom I was going to dognap Penny for good. I had been praying and asking God to provide us with the right pooch at the right time. Well, in January, my mom had another heart issue. Due to some concerns afterward, Penny came to live with us full-time. So as Carolyn mentioned on Monday when she took over my blog–I’m a new puppy mama. Isn’t Penny just the sweetest thing? Caring for a dog is like caring for kids, except dogs can’t speak, and kids shouldn’t be doing their business outside. Penny demands attention like a kid and insists on getting up in the middle of the night for a potty break. I’m remembering those early years with my kids. Unfortunately my body has aged 20 years, so I’m more tired now, but we love Penny so much and wouldn’t give her up for anything. 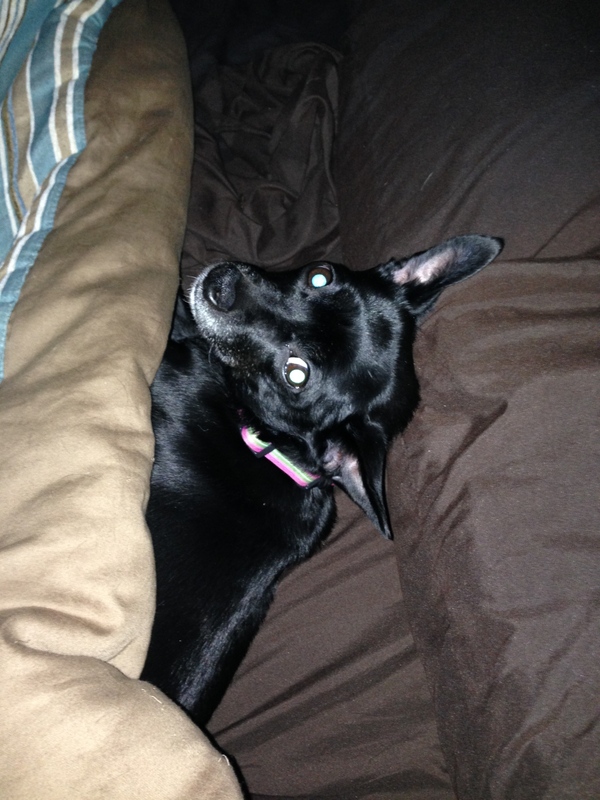 Your Turn: Do you have any pets? What’s your favorite part about being a pet owner? What advice do you have to share with this new puppy mama? 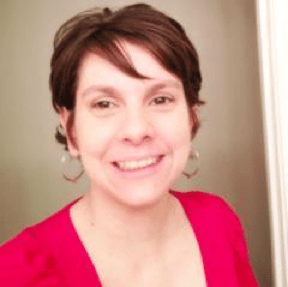 I’m Carolyn, a friend of Lisa’s, and I’m here as a self-invited guest blogger. Lisa and I spend a lot of virtual time together. We discuss almost everything. How tired we are. How cold our feet have been this winter. How much I want to eat cookies and cupcakes. How much she loves to watch NCIS. We lift each other up. We complain to each other. We celebrate together. For a few weeks we’ve been discussing blogging (amidst the cupcakes and the weather gripes). I recently had a blog makeover and upgraded my space. That motivation along with a few snow days that popped up during January and I think I’ve got my blog clicking along nicely. I scheduled a few posts, had ideas for a few more, and generally enjoy writing. I like blogging. In my line of work as a librarian I like to think that someone is reading it and getting at least one small idea from what I have to share. It’s not that I object to love and marriage! But when Lisa and I talk most days we discuss other things she is interested in. Did you know Lisa is a scrapbooker? That she’s knitted something for just about everyone she knows? I don’t know how she keeps up with her crafty nature along with her day job and her writing job. See! Precious! Penny is adorable and Lisa is like any new puppy-mamma and has news to share! I read a lot of blogs and Twitter and what I love about blogs is when the genuine nature of a person comes through. I don’t read a large quantity of author blogs, but I read a few. My favorite author blogger writes some about writing when it is a thought she has to share that she is passionate about. She also blogs dialogue her toddler twin nieces are saying when they are being silly, and shares about her experiences while taking trapeze lessons! What I love about my favorite authors on Twitter is when they post about their obsessions with bacon or how they’re surviving this chilly snowy winter and aren’t sure they can be around their school-aged kids one snow-day longer! I don’t follow because they are writing about the same things their books are about. Maybe I’m the only one…but I doubt it. I think Lisa has felt like her blog space here is an obligation as a writer. That she’s required to share wisdom and experiences directly related to writing or to her writing focus which is love and marriage. Except…as writers the things we do outside of writing influence our writing the most. Otherwise writers would all be writing about writing. But instead writers are writing about life. About the little things that come together to make life exciting and meaningful. I’ve challenged Lisa to keep her blog updated but to avoid the pressure of writing about the same things she writes about professionally. Instead I want Lisa to have more fun writing about the little things that make life meaningful. Lisa here: Umm, so my blog was taken over by one of my all-time favorite people on the planet. Carolyn and I met online over 12 years ago when we bonded over a mutual interest. She read my first novel when it was still in the newbie writer stage…and we’re still friends. Man, that was some awful writing. In most realms Carolyn is an elementary school librarian who blogs at www.Risking-Failure.com and tweets at @carolynvibbert. But that’s all just an act because the real Carolyn reads a lot of YA lit, fluffy romance, and Christian fiction. She also whines about cold feet in the winter, and eats too many cookies no matter the season. Your Turn: What are your favorite things to do, other than anything book related?